it’s an… alien! – Hi, I'm Caroline. 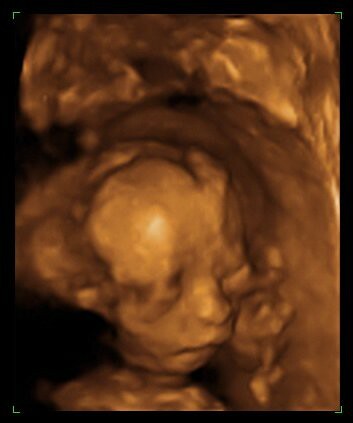 We had our second ultrasound yesterday, and I’m so proud to present to you, dear Internets, our adorable alien daughter. Our first ultrasound was done in May, around 7 weeks, and at that time there wasn’t much to see. Our baby was a cashew-shaped blob on the screen (making me wonder if I’d had an affair with Mr. Peanut–it’s hard to resist the monocle) and the only thing that differentiated her from such was a heartbeat. Most cashews don’t have heartbeats. Obviously she’s grown a bit since then… and she actually looks like a baby! Yay! She’s kicking up a storm in there, too… she skipped the light fluttering stage entirely and went straight to tap-tap-tapping, and those taps are growing stronger every day. The ultrasound showed her kicking and bouncing her little legs up and down. More pictures at Flickr! Amazingly clear ultrasound picture….technology keeps getting better & better. I like the nickname Little Boo! I love the little picture..I use to make clothes for the girls..It was fun..It is exciting waiting for the little one..
Will keep checking back and see how things are going..
Will keep checking back and see how things are going. I have such a hard time leaving you a comment..Hope this will go through. WOW! it’s crazy how good technology is these days! Congrats on your bubba!! Holy Moly! Ultrasounds sure have changed since my babies were born! This is amazing, and yes, somewhat alien looking, but very endearing all the same! I like the name Little Boo! Man, that’s just CRAZY! I just missed the 3D boat. I personally like Thumper. I wish I’d thought of that when my son was kicking my insides out. I want a 3D ultrasound-it took some serious guessing to figure out what I was looking at in the old fashioned ultrasound we got.